Last weekend I taped The Santa Clause for the kids because when I was in high school I thought that was a pretty cute movie. About 10 minutes into watching it with the kids, I started thinking maybe it wasn’t such a great idea since the plot rotates around one’s belief in Santa and both my kids haven’t even heard the whole “there’s no such thing” concept at all yet. I mean, now they have… but they hadn’t! Anyway, it didn’t matter, as Baby Girl thought it was so cool that your dad could turn into Santa that the whole thing kind of flew over her head, most likely in a sleigh pulled by reindeer. Whew! Today’s lunch could have been a little more colorful, but since I woke up late because I went to bed late (2:30 AM) because I rented and watched Julie & Julia, I had to throw this guy together as fast as possible. This took me about 10 minutes to do as the food was all leftovers and the only thing that took time was Santa himself. Hopefully I have time later to do the same Santa in another lunch. At the end of today’s post, I’ll announce the winner of my drawing for a free copy of The Manga Cookbook . I must say that I did enjoy the movie. When it first came out it seemed like something I’d really enjoy because it involved food blogging and cooking and being a disaster in the kitchen, all three of which are right up my alley. I’d bought Mastering The Art of French Cooking last month out of curiosity because I really have no idea what French people eat, but I ended up adding it to my cookbook graveyard after reaching the chapter on soups because there seemed to be onions and leeks in basically everything. Since my silly husband is mentally “allergic” to onions, that kind of defeated my little bout of interest. I’ll definitely have to go look at other recipes now though. The stew featured in the movie sounds yummy!! I identified more with Julia than with Julie though, mostly for the final scene, because when that happens to me, I know I’ll have the same shrieking reaction. ^_^ Plus, I had unfortunately read a bit about Julie Powell and how so many people actually detest her and her book, so I was a bit tainted in my opinion of her. I was a bit surprised to see that in the movie she’s portrayed as an excellent cook because the trailers made me think she started off crappy and Julia Child made her a brilliant chef. Instead she started off spectacularly, bombed in the middle, and finished off nicely but sadly. He was very easy to put together. I have a little cloud cutter, which I used for his beard, and a scallop cutter that I used for his hat trim and ball. The trim was a bit too long, so I broke one ball off and used it for the tip. His face is a circle made of ham and I punched his face features from nori with my new nori punch. His hat is the outer skin of an imitation crab stick, which I cut with kitchen scissors. I was going to cut HO HO HO! out of the cheese, but couldn’t find my freaking ‘H’ cutter. 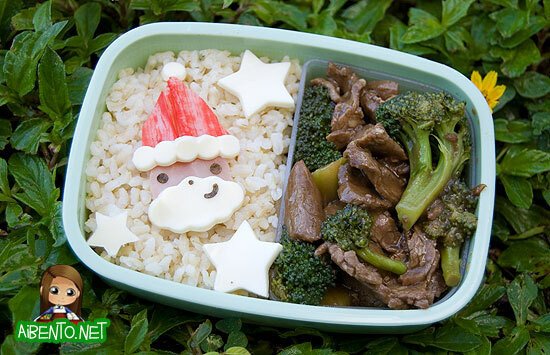 Santa rests on top of some nuked frozen brown rice and on the other side of the box is some leftover Beef with Broccoli that I made from Jaden Hair’s The Steamy Kitchen Cookbook that I bought last month. I made myself choose between Jaden and Ree Drummond’s The Pioneer Woman Cooks and ended up choosing Steamy Kitchen (sorry Pioneer Woman!!) because hers seemed to have recipes closer to my palate and Ree has an obsession with butter, something I can’t do right now since I’m trying to lose weight again. The dumbest part about me getting Jaden’s book is that I ended up gravitating to the one thing in her book that I already eat on a consistent basis instead of trying something new. I’ve had my own beef broccoli recipe that I have used since my college days and when I saw that her recipe called for balsamic vinegar I kind of flipped out. A couple of years ago I was into watching Good Eats and I trusted Alton Brown completely. When he did a pot roast show, I had to give it a shot. So I went out and bought a roast, balsamic vinegar, cocktail olives, and raisins. It was disgusting! I don’t know if I did it wrong, but I hated it and ever since then I’ve been leery of balsamic vinegar. On the bright side, I kept the bottle, so two years later, I poured a couple teaspoons into the stir fry sauce and holy crap it was the best Beef Broccoli I’d ever tasted. I’m serious, this stuff was godly. Mr. Pikko stated that it was VERY good and we both overate. I was craving it again this whole week, so I made it for dinner last night, but with way more meat. We ended up cleaning most of it out. 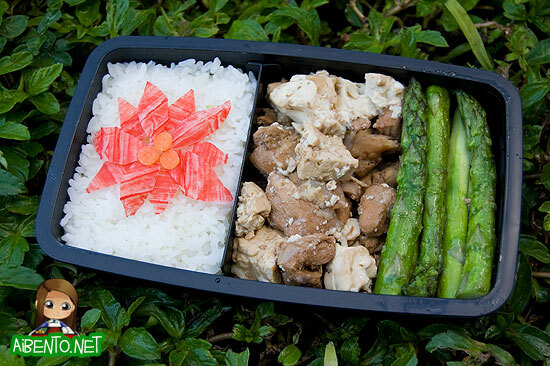 Speaking of Mr. Pikko, I made him a bento as well. His was done in manly fashion of course, with big hunk portions of stuff. 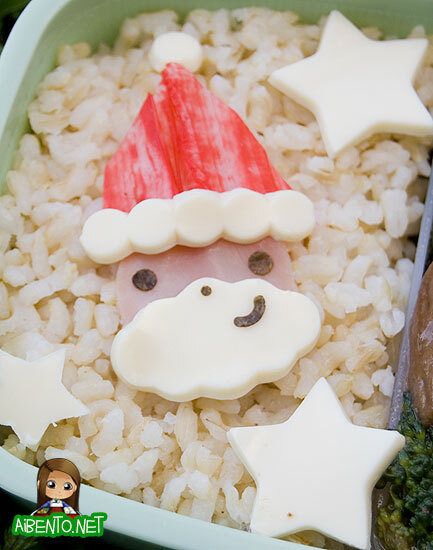 I added an imitation crab poinsettia on top of the rice to make it festive, but he ended up not knowing what the heck it was anyway. The middle is made of slices of the thinnest baby carrot I could find in the bag. 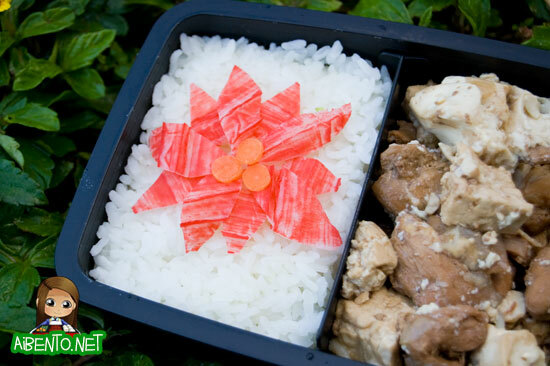 To get the skin thin like this, you need to buy a certain type of imitation crab. The right local brand here is the Okuhara one and incidentally, it’s also the best tasting one. I used to eat these as a snack by itself all the time. I simply cut a slit into one and peeled it off, then used kitchen shears to cut petals out. I’m sure my dad would get a kick out of this as he used to grow poinsettias. I have a pic somewhere of me and my brother in a sea of them. It’s pretty cool! Now for the winner of my drawing! 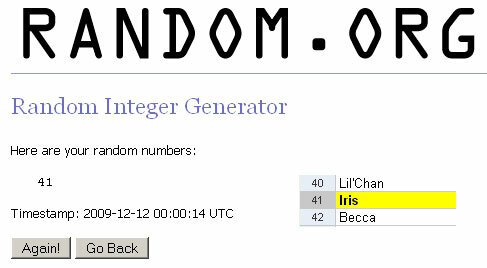 I had a total of 72 entries and the winner is…..
Congrats! I hope you enjoy the book and that your lil’ cousin does too! Tomorrow is UFC 107 with BJ Penn, so me and the Mr. will be down at Giovanni Pastrami. Go BJ!